When the Telugu film Jabardasth released earlier this year it created a big ripple and shook up YRF. Directed by Nandini Reddy, Jabardasth was a Telugu-Tamil bilingual (called Dum Dum Pee Pee in Tamil) featuring Siddharth and Samantha in the lead and came across as an unofficial remake of YRF’s Band Baaja Baaraat. 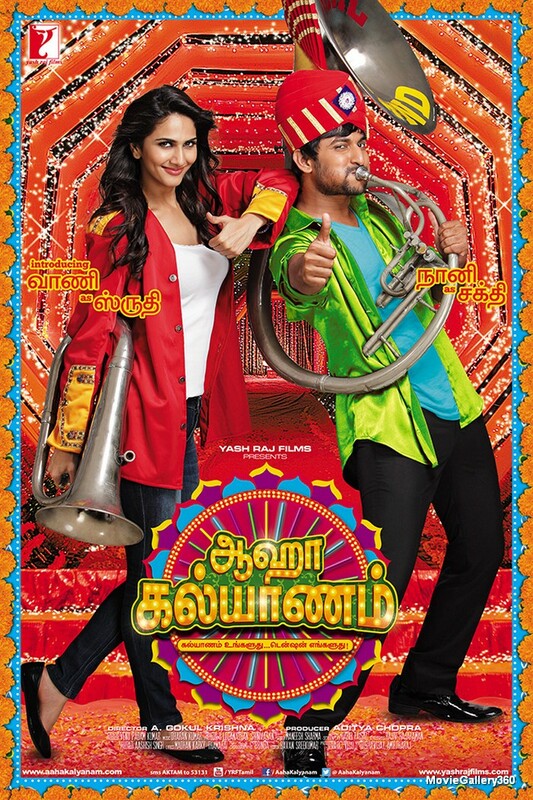 With YRF already keen to remake this successful rom-com in Tamil and Telugu, they quickly stalled the release of the Tamil version i.e Dum Dum Pee Pee by taking the legal route.This was immediately followed by their announcement of Aaha Kalyanam, the official remake of Band Baaja Baaraat in Tamil and Telugu. Though originally meant to be shot in both languages, apparently it has now been shot in Tamil alone and dubbed into Telugu. A. Gokul Krishna makes his debut into direction with Aaha Kalyanam. The film features Nani and Vaani Kapoor (who was earlier seen this year in Shuddh Desi Romance). Other actors include M.J.Sriram and Simran. The music is a totally new soundtrack by Dharan Kumar while Loganathan Srinivasan is the DOP and Bavan Sreekumar is the editor. Aaha Kalyanam is all set to hit the screens in both languages on 7th February 2014. Lets see if it can replicate the success of the Hindi original. Here’s the trailer of the Tamil version. WTF is this, same sets, and bad dubbing for Vani Kapoor.